Look, up in the marketing department, it's another game based on a movie for some fast cash... No Surprise, It's Superman Returns: The Video Game. A step in the right direction. The premise sounds like some like an awesome idea. Let's bring Superman into a new game that really makes players feel what it is like even in a small way what it would be like to be Superman. Superman Returns is not a bad game mind you. It's just not a super game either. All the fixings are there for a game just raring to launch a player into one Super Adventure. 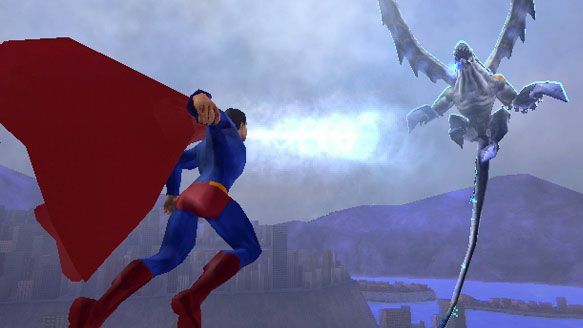 While not as bad as past Superman games, Superman Returns the Video Game leaves one wondering what the heck happened? The tie in to the movie is minimal at best. In fact, what is shown in cut scenes is just not enough to explain away a few things. Like the whole Lex Luthor and the Crystals thing. If you have not seen the film some of this mixed up plot. or more like rag tag plot will just leave you scratching your head. Don't get me wrong, this game is very much a step in the right direction for the Man Of Steel. Some things are just lacking, like the film theme music which every fan knows and loves is very absent. Poor Brandon Routh is reduced to delivering one liners that have gone out with the 80's. Graphics are ok but for a next generation system I was expecting so much more. The other thing that shoots a Kryptonite bullet in the foot of the game is the missions. these are just down right repetitive. Fly around (Which is the cool part) then fight a bunch of rampaging robots. Now rinse, repeat dozens and dozens of times until you get a glaze in your eyes and your brain is numb. So ok, later there are Dragons, yes I said Dragons but other than that. It's really just a new skin for the robot foes almost. Some of the more cool situations which would have lent itself well for a sense of accomplishment are taken away from the player, climaxes like flying and stopping a rocket from blasting a building are almost an anticlimax because rather than the player doing it all. A cut scene instead is triggered showing the outcome. There was some satisfaction in beating the giant Metallo though, even that is short lived. I would love to have latched onto the rocket and force it upwards and away from the city myself... Bummer man, real bummer. Even the introduction of characters like Mxyzptlk seem to be some odd ball attempt at fixing the problem after the designers realized it was getting too repetitive. But racing a little gnome leprechaun dude around the city just is not enough to save the game. Not to mention it can be a bit frustrating, since controls are a bit touchy and going at super speed and slamming into anything stops you dead until you can get around the obstacle. Hence my wish for being able to smash through stuff. Some variety would have been nice; every darn time some one is yelling for help it's either a building on fire or Robots, or monsters on a rampage. A little diversity in the saving people department would have been nice. Even with the extra time the game had before release did not seem to help it much. Is the game entertaining? Yes, in small doses. I would not say too many people will do a long game session with the game. Maybe an hour, two at best before it gets old... very very fast. This is another case where I have to Say Spiderman 2 did a way better job mixing story and extra elements into the game. Too true some things did get repetitive in Spiderman as well, and perhaps I am being overly critical here. 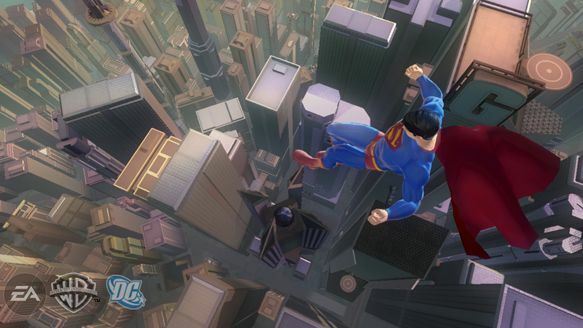 Superman Returns: The Video Game still is light years ahead of any other Superman game title that has come before it. Is the game fun? Yes. In small doses. I am about two or three hours into the game and already at 60 to 70% done with it. So called side missions in the game are not much on missions or action. Other than a really kind of cool sequence in the beginning when you have to learn how to use your powers of heat vision and freezing breath. In this the player gets to save the city from a bunch of falling meteors. Other Missions that are side missions are the occasional building ablaze, use of the freeze breath or super breath to extinguish the flames is the course of action to take here and happy faces all around. Other side missions are some missions that you kind of have to scratch your head at, like trying to race Mr. Mxyzptlk from one end of Metropolis to the other. As I stated earlier on, not one of my favorite parts of the game. Other than honing your flying skills I really don't see much fun in it. Be prepared to smash into a lot of buildings but oh no, you don't crash through them like those wicked cool sequences in Superman films, you just sort of make a bit of a dent and come to a crashing halt... What a let down. One thing on the whole flying thing. It rocks. If nothing else I love flying around in the game. It would have been nice to be able to fly into space and maybe even have some interesting missions there on the fringes of the earth but it is not to be. Flying up high, oh so high and you kind of come to a barrier you just cannot get past. Fear not, while just a tad annoying, the game makes up for it by having a very cool effect. Flying Superman very fast, things soon become a blur and I do believe the sound barrier is broken with a mighty crack and a bit of red glow as the man of Steel rockets through the sky. Nice, very nice. 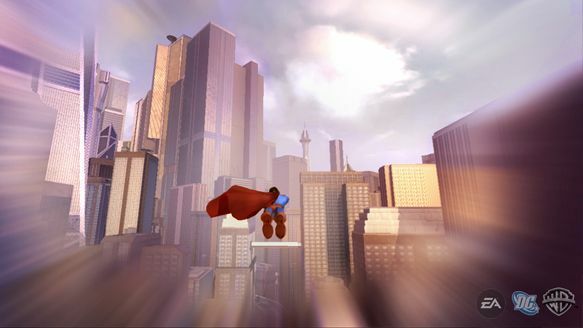 As you may have guessed the game takes place in Metropolis, and through the game you are Superman, no switching back and forth from Clark to Superman. Oh well, would have been nice. I can live with it though. Of course you cannot go underwater, nor walk into any buildings, its all outside adventure. Being Superman also means your darn near invulnerable to damage, so Superman does not have a health meter, he instead has a bar that measures his power or stamina. When that goes low, Superman is in a bit of trouble. On the other hand in a rather interesting twist in regards to health meters. The city has a health meter. So this brings on a bit more of an urgency to dealing with the rampaging baddies. Because when Metropolis' health meter goes down, it is the end of the game. Well you can restart the chapter of course, but you get the idea. Playing the game is pretty cool for the most part; flying around looking at the sites is pretty fun for a while. Other than having to rush to save the city, Kids may like the game because they get to play as one of their favorite super heroes. Though the rating says the game is for teens or older. Parents can get the demo on Xbox Live Marketplace when signing onto to Xbox with your Xbox 360. As always parents may want to take a drive with the game first to see if they feel it is right for their house hold. Too each his or her own. Superman has some extensive combos that become unlocked as you progress through the game. While it can be a bit of a chore to string them together, they are fun once you get the hang of it. Although I do find myself mashing only certain combos when things get a little hectic. Upgrades happen automatically and as far as I can tell, the player has no say so in what power is upgraded. This at least would have lent itself to some small level of custom ability. Other than flight, Superman has super breath, heat vision and freeze breath, these are controlled and chosen by use of the pad and activating the ability is done with use of the right trigger. Targeting a certain enemy is done by use of the left trigger. Used in conjunction with the right bumper which triggers super speed. while targeting an enemy the player can bash into them and knock them back a bit. Then let loose with one of the breath powers for some truly super combos. The two analog sticks are used for direction control with the left and pitch, and bank controls with the right. 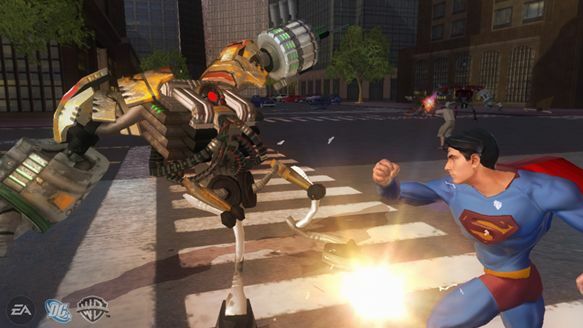 Superman returns: The Video Game is not the SUPER game everyone hoped for but neither is it a really bad game. It is a step in the right direction for the game franchise and Electronic Arts would do well to keep the path and spice it up a bit. Listen to some of the fans and see what can be utilized. One of the things that would be great for any game out there is the support and the ability to do add on packs through Xbox live market place. Unfortunately Superman Returns does not utilize any add on capabilities. Other games are experimenting with this and if successful could be a valid way for games like Superman Returns: The Video Game to get ad ons to an already released game and expand on its disk life in the gamer's household. True a game has to be designed to be able to utilize add ons. But just think of the possibilities. Is it cost effective for the company who knows. 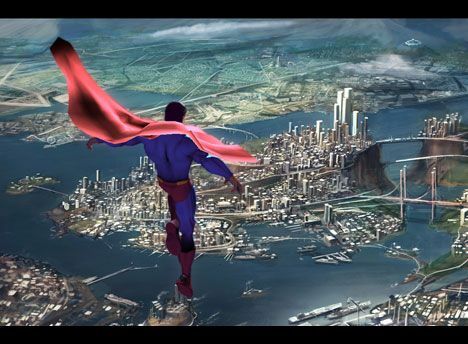 Well now that I have went off on a tangent, let me close by saying, I like Superman returns: The Video Game. I just don't love it.